Quick Pole, your complete solution to pole line assessments. Quick Pole is one of the industry's most capable and easy to use software programs for doing utility pole line design and analysis today. It offers the best value of any software tool on the market for similar capabilities and performs a structural analysis of many poles at the same time using the latest linear or nonlinear methods. Quick Pole also performs its own sags & tensions calculations, clearance tests, mid-span and on-pole separation tests, extensive reporting and many more code compliance tests against national and pole owner standards. Quick Pole includes all the tools you need in one integrated software package. It includes the features of pole structure analysis, sags & tension calculations, clearance tests at random points along the span, mid-span and on-pole separation tests and permit quality submission reports. Now with IKE4 integration. Capturing field data and importing it into Quick Pole has never been easier, faster or more efficient. Quick Pole has combined world class data collection with world class analysis capabilities. Quick Pole offers advanced linear/nonlinear finite element analysis engine for structural analysis. It also performs its own sag and tension calculations to better address unlevel spans and the nonlinear stress/strain characteristics of wires/cables/messengers. Quick Pole is intuitive to use, requiring very little training, ensuring efficiency and productivity. Full training support is also available. Quick Pole adheres to and enforces standards such as CSA, NESC and GO 95. Along with these choices, it can also enforce a wide range of Pole Owner standards that exceed these minimum requirements. Quick Pole can evaluate an entire area of poles at once and supports many methods of directly importing field data. Quick Pole can also support both GIS and non-GIS modes of operation. Regardless of your other software tools and field data collection methodology, Quick Pole can help you. Our industry is evolving. Quick Pole is keeping up! The process of determining the proper size of utility pole to use in different situations is a time consuming task for the utility industry. To make the process easier to use, various simplistic methods and rules of thumb have been developed by numerous organizations and people over the years. Most of these have their fundamental design roots in the 1940 to 1950 era when the best computing engine available was the slide-rule. In the majority of cases, these practices would always result in a "safe", but oversized, pole class recommendations. One of the disadvantages of these methods however, is that the more complicated and loaded a pole is, the more time consuming it became to use the process, and the more over-provisioned the final structural size recommendation became. There were many aspects of structural analysis which needed to be ignored because of the time required to deal with all the details. Many, many assumptions were made in order to facilitate calculations. The latest code standards in Canada and the US, as well as many other parts of the world, have evolved to the point where absolute defendable accuracy is required. 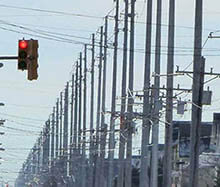 The decision to install or add to utility poles in a particular manner is being questioned by the regulators, the legal system and the public at times. It is no longer defendable to use "Rules of Thumb" or other means that are not directly traceable back to solid Engineering Principles. Sonideft understands this requirement very well. We go to great lengths to expose our calculation results and methodologies to the critique of engineering professionals and welcome any opportunity to explain why we feel certain calculations are the most appropriate. As an example of our long-term commitment to quality, the precursor product to Quick Pole (Autopole) utilized a Finite Element Analysis Engine since 1995, almost two decades before any national codes mandated its use (CSA-2015).